It’s February, and that means that it is time for the first show for Thompson boxing Promotions. On this night it was Path to Glory, held at the Doubletree Hotel in Ontario, CA. The original main event had to be scrapped when Jose Ramirez could not make weight and the fight was scrapped. That was unfortunate to say the least for Erick Ituarte, who was primed and ready to fight. But before the main event, Thompson Boxing and owner Ken Thompson held a raffle for injured fighter Daniel “Twitch” Franco. In case you forgot, Daniel suffered a very serious brain injury in June of last year and had to endure surgeries to repair two brain bleeds. The costs of his hospitalization and rehabilitation are understandably huge. Thompson promised to match all monies donated in the raffle – way to go, Thompson Boxing! 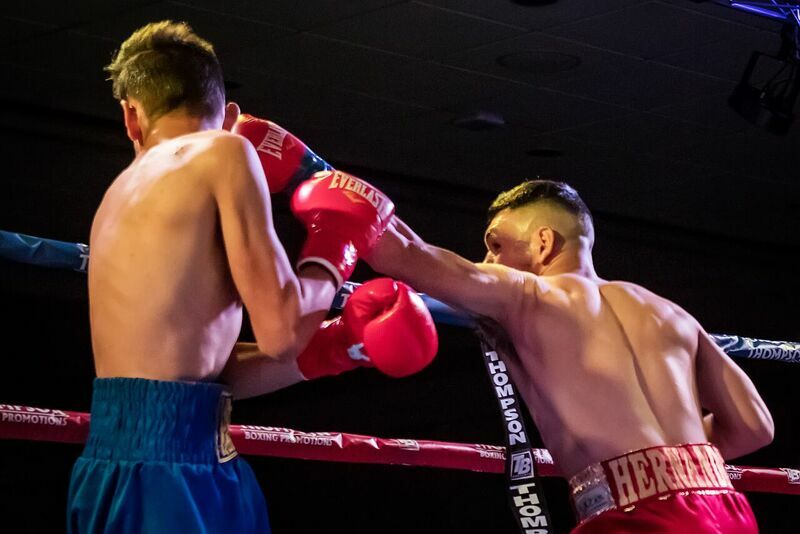 Back to boxing, and our main event saw super bantamweights take to the ring, as Isaac “Dinamita” Zarate (14-3-3, 2 KOs) took on Christian Ayala (11-2, 4 KOs). This fight was scheduled for eight rounds. No damage was done to either fighter in the first round, as they seemed to be measuring each other and feeling each other out. That all changed in the second as both men picked up the action and landed punches. In the third they continued throwing and landing several punches in a row, not just throwing one and stepping back. Zarate was proving to Ayala that he had the most skill. We saw some very good, heavy punches land for both fighters in the fourth. Neither man was spending much time on the body, Isaac a bit more, but the head shots were accurate for both men. The fifth was much like the fourth, with some solid leather landing for each fighter. But Christian was getting sloppier, while Zarate stayed consistent. As the fight went on, Ayala was holding more and more, and that was very evident in the sixth round. Referee Raul Caiz, Jr. had to break them up several times during those three minutes. Zarate launched a good head hunting attack in the seventh, and was able to find his target often. We moved into the eighth and final of this hard-fought contest. There had been “Isaac” chants during this entire fight, and they picked up in the last three minutes. This final round was a bit sloppy at times, but Isaac was still able to find his target. That would cause Ayala to hold again. This fight was also full of head butts, blood, and several slips to the canvas. We went to the judges for their decision. The three that count saw the fight all for Zarate, 77-75 twice, and 78-74. 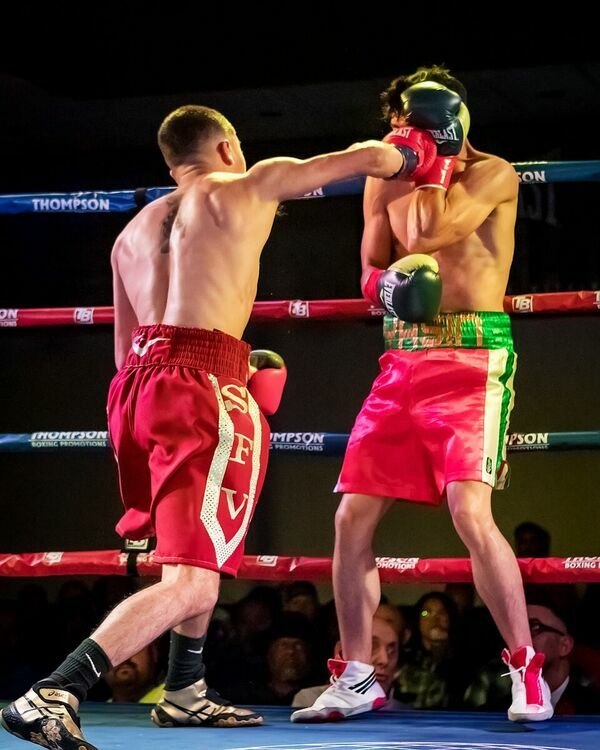 In the co-main event, Ruben Villa IV (10-0, 4 KOs) went up against Juan Sandoval (7-20-1, 4 KOs). The original opponent for Villa had been Ruben Tamayo, but he fell ill, so Sandoval stepped up to the plate and took the fight. This bout was for a scheduled six rounds in the super featherweight division. These two did not waste a lot of time and went right to work on each other, with Villa definitely showing the way in this opening round. Sandoval was more aggressive in the second then he had been in the prior round, and Ruben backed off a bit. In the third, it was mainly no harm, no foul. The fight was lacking punch, pardon the pun. Perhaps things would pick up in the second half of the fight. And so it did. Ruben decided to make a fight of it and stayed on his opponent the entire three minutes. In the fifth the men fought forehead to forehead. In the middle of the battle Villa reached around and punched Sandoval in the kidney. Referee Lou Moret was not pleased with that, and warned Ruben that the next time he would take a point. In the sixth and final they were still fighting, quite a difference from the first three rounds. However, I can’t say that this was necessarily an interesting fight. We went to the scorecards. Two judges saw it 60-54, while the third had it 59-55, all for Villa. 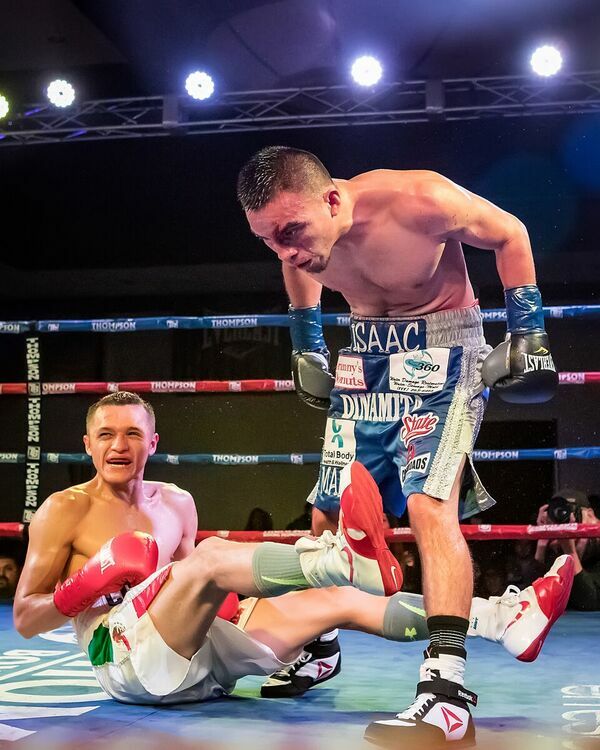 Saul Sanchez (7-0, 4 KOs) faced off against Pedro Melo (17-19-2, 8 KOs) in a super bantamweight fight that was scheduled to go four rounds. Both men came out and were able to land punches in the opening round, but it was Sanchez who was hitting with the crisper shots. The second was more of the same. Melo was game and trying to hurt his opponent, but Saul didn’t seem to be fazed by anything Pedro threw, and was landing most of what he threw. The third round was a war between the two. They both were on fire, and it was a bit of a surprise that one of them didn’t hit the canvas. It was by far the strongest round for Melo, but Sanchez was still proving that he was the bigger puncher overall. The fourth and final continued to provide a lot of back and forth action. Both men stayed on the attack. Still, we went to the scorecards for the results. All three of the judges saw the fight the same, 40-36, giving the unanimous decision to Sanchez. Bantamweights were up next featuring two undefeated fighters, Mario Hernandez (5-0, 2 KO) and Jorge Careaga (1-1, 1 KO). This fight was scheduled to go four rounds, but it never got close to that. Mario just blasted Jorge with body shots, dropping Jorge almost immediately. He got back up, but just as quickly was put down again, and the fight was waved off at :52 of that very first round. 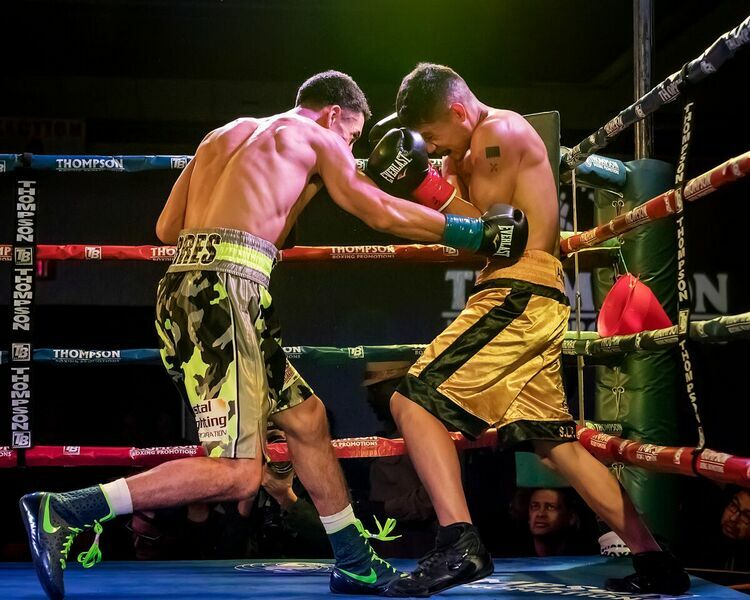 In a fight scheduled for four rounds in the lightweight division, Ruben Torres (4-0, 4 KOs) went up against Anthony Ruiz (2-5, 2 KOs). Torres came out lightning fast in the first round, and his quick skills really seemed to surprise his opponent. Ruben was not only fast, but accurate. A little left hand that seemed to be almost playfully thrown out there put Anthony down, and just a few seconds later a one-two combination, the last being a body shot, put him down again. Right at the end of the round Anthony went down yet again, but referee Caiz, Jr. took a point away from Ruben for hitting Ruiz when he was down. After bell sounded however, the fight was waved off as Ruiz could not continue, giving the knockout victory to Torres. The first of the night saw lightweights take to the ring for a bout scheduled for four rounds. 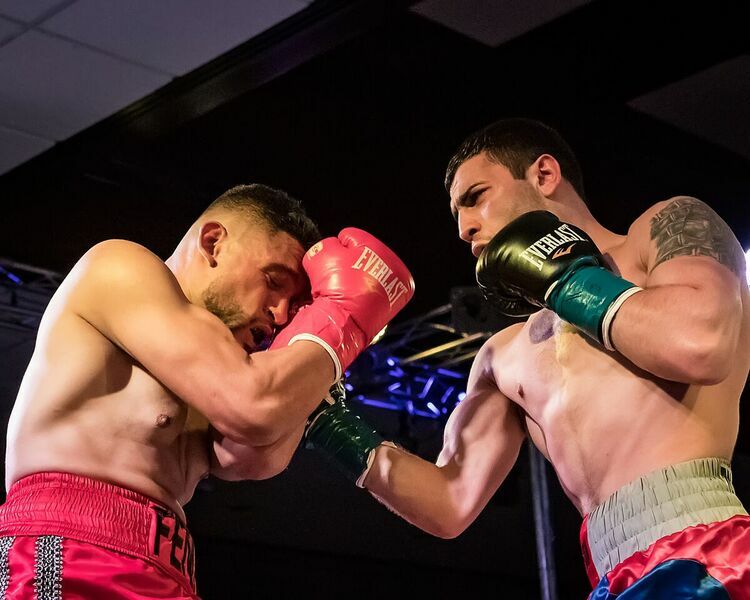 The current WBO Youth world champion Zhora Hamazaryan (9-0, 6 KOs), who was fighting in the United States for the first time, faced off against Sergio Ramirez (3-1, 3 KOs). Sergio was by far the aggressor in the opening round, with Zhora showing flashes of brilliance, but not often enough. In the second, a right hand from Zhora knocked Sergio down. That came as a bit of a surprise, as he had not really shown that much early on. Even with the knockdown, it was still Sergio who landed punches with the most power. Both men came out swinging in the third. As the round went on it was the most competitive one we had seen thus far – much more evenly matched, but Hamazaryan was coming on. In the fourth and final each fighter took a turn working each other on the ropes. I am not sure what took Zhora so long, but he really came out looking for blood in this lat round. No knockout though, so we went to the scorecards. Two of the judges had it 39-36, while the third scored the bout 40-35, all for Zhora. Overall it was a good night to open the 2018 Thompson Boxing season. Too bad that Erick’s fight had to be pulled off the table, but look for him soon. Finally, huge kudos to Thompson Boxing and all of those who contributed financially to the raffle for “Twitch”. It was great to see him there – quite a miracle!